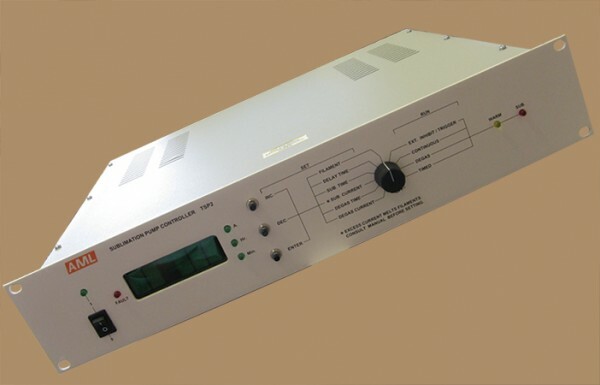 • 2U (88mm) high full-width instrument for easy rack mounting. • Low cost. Simple, robust and reliable design, which is easy to service. All output switching is by semiconductor devices. • Low-noise. Complies with EC EMC and LV directives. Power factor >0.97. • Sublimation current settable over the range 30-55A in increments of 0.1A. Suits 85% Ti, 15% Mo filaments from 1.8 to 2.1mm diameter. magnetostrictive stress or mechanical resonance. • Pump current is accurately regulated in order to automatically compensate for mains variations and pump cables warming. • No in-service adjustment is required. • Self-timed delay between getter renewal adjustable from 1 minute to 99 hours. • Filaments may be run for degassing at currents between 5A and 25A to prevent overloading the ion pump. Filaments can be kept warm at the end of a system bake. • Sublimation inhibit/trigger function by external switch or relay. • Suitable for a wide range of cartridges with up to four filaments. • Indicates open-circuit filament, shorted cable/filament, inhibit, overtemperature. Thermal overload protection. • 483 x 88 x 365.2mm. • 11kg net (Shipping weight 13kg). Power Consumption : Less than 20W when idling, less than 700W when sublimating at 55A with a maximum length cable. Output Current : Regulated at 30 to 55A RMS x 0.1A in sublimation, 5 to 25A RMS x 5A in degas. Output Voltage : Determined by the lead and cartridge resistance. Maximum output voltage is ≥9.5V RMS at 45A. Timing : Sublimation period 0.1 to 3 minutes x 0.1 min. Delay interval 1 to 59 minutes, 1 to 9.9 hours. Degas time 1 to 99 minutes. All timing is derived from the mains supply frequency. Output Duty Cycle : 100% at 300W output power and less than 30°C ambient temperature.